Over two thirds of Earth's surface is covered by water; less than a third is taken up by land. As Earth's population continues to grow, people are putting ever-increasing pressure on the planet's water resources. In a sense, our oceans, rivers, and other inland waters are being "squeezed" by human activities—not so they take up less room, but so their quality is reduced. Poorer water quality means water pollution. This unit is a minimum of 4.5 hours. 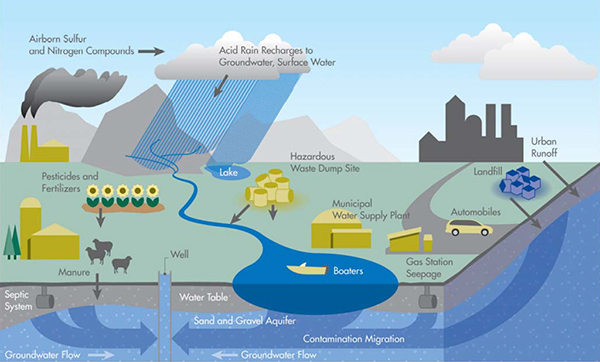 Water pollution, both to groundwater and surface water, is a major global problem, the effects of which influence human and other biological systems. What strengths and weaknesses of the systems approach and the use of models have been revealed through this topic? How are the issues addressed in this topic of relevance to sustainability or sustainable development? To what extent can water pollution be considered as a system? Are the existing solutions to pollution likely to cope with current levels of water pollution? Which is the lesser evil - less food production or eutrophication? How are the linked? How is water pollution likely to change in the next decades? Give reasons for your answers. ​4.4.U1 There are a variety of freshwater and marine pollution sources. Industries produce huge amount of waste which contains toxic chemicals and pollutants which can cause air pollution and damage to us and our environment. They contain pollutants such as lead, mercury, sulphur, asbestos, nitrates and many other harmful chemicals. Many industries do not have proper waste management system and drain the waste in the fresh water which goes into rivers, canals and later in to sea. The toxic chemicals have the capability to change the color of water, increase the amount of minerals, also known as Eutrophication, change the temperature of water and pose serious hazard to water organisms. The sewage and waste water that is produced by each household is chemically treated and released into sea with fresh water. The sewage water carries harmful bacteria and chemicals that can cause serious health problems. Pathogens are known as a common water pollutant; The sewers of cities house several pathogens and thereby diseases. Microorganisms in water are known to be causes of some very deadly diseases and become the breeding grounds for other creatures that act like carriers. These carriers inflict these diseases via various forms of contact onto an individual. A very common example of this process would be Malaria. Mining is the process of crushing the rock and extracting coal and other minerals from underground. These elements when extracted in the raw form contains harmful chemicals and can increase the amount of toxic elements when mixed up with water which may result in health problems. Mining activities emit several metal waste and sulphides from the rocks and is harmful for the water. The garbage produced by each household in the form of paper, aluminum, rubber, glass, plastic, food if collected and deposited into the sea in some countries. These items take from 2 weeks to 200 years to decompose. When such items enters the sea, they not only cause water pollution but also harm animals in the sea. Oil spill pose a huge concern as large amount of oil enters into the sea and does not dissolve with water; thereby opens problem for local marine wildlife such as fish, birds and sea otters. For e.g. : a ship carrying large quantity of oil may spill oil if met with an accident and can cause varying damage to species in the ocean depending on the quantity of oil spill, size of ocean, toxicity of pollutant. Fossil fuels like coal and oil when burnt produce substantial amount of ash in the atmosphere. The particles which contain toxic chemicals when mixed with water vapor result in acid rain. Also, carbon dioxide is released from burning of fossil fuels which result in global warming. Chemical fertilizers and pesticides are used by farmers to protect crops from insects and bacterias. They are useful for the plants growth. However, when these chemicals are mixed up with water produce harmful for plants and animals. Also, when it rains, the chemicals mixes up with rainwater and flow down into rivers and canals which pose serious damages for aquatic animals. A small leakage from the sewer lines can contaminate the underground water and make it unfit for the people to drink. Also, when not repaired on time, the leaking water can come on to the surface and become a breeding ground for insects and mosquitoes. An increase in earth’s temperature due to greenhouse effect results in global warming. It increases the water temperature and result in death of aquatic animals and marine species which later results in water pollution. 4.4.2U Types of aquatic pollutants include floating debris, organic material, inorganic plant nutrients (nitrates and phosphates), toxic metals, synthetic compounds, suspended solids, hot water, oil, radioactive pollution, pathogens, light, noise and biological pollutants (invasive species). Some pollutants do not dissolve in water as their molecules are too big to mix between the water molecules. This material is called particulate matter and can often be a cause of water pollution. The suspended particles eventually settle and cause a thick silt at the bottom. This is harmful to marine life that lives on the floor of rivers or lakes. Biodegradable substances are often suspended in water and can cause problems by increasing the amount of anaerobic microorganisms present. Toxic chemicals suspended in water can be harmful to the development and survival of aquatic life. ​Toxic Metals and solvents from industrial work can pollute rivers and lakes. These are poisonous to many forms of aquatic life and may slow their development, make them infertile or even result in death. ​Pesticides are used in farming to control weeds, insects and fungi. Run-offs of these pesticides can cause water pollution and poison aquatic life. Subsequently, birds, humans and other animals may be poisoned if they eat infected fish. Some wastewater, fertilizers and sewage contain high levels of nutrients. If they end up in water bodies, they encourage algae and weed growth in the water. This will make the water undrinkable, and even clog filters. Too much algae will also use up all the oxygen in the water, and other water organisms in the water will die out of oxygen starvation. Many industries and farmers work with chemicals that end up in water. These include chemicals that are used to control weeds, insects and pests. Metals and solvents from industries can pollute water bodies. These are poisonous to many forms of aquatic life and may slow their development, make them infertile and kill them. Microbiological pollution is the natural form of water pollution that is caused by microorganisms in uncured water. Most of these organisms are harmless but some bacteria, viruses, and protozoa can cause serious diseases such as cholera and typhoid. This is a significant problem for people in third world countries who have no clean drinking water and/or facilities to cure the water. ​4.4.U3 A wide range of parameters can be used to directly test the quality of aquatic systems, including pH, temperature, suspended solids (turbidity), metals, nitrates and phosphates. 4.4.U4 ​Biodegradation of organic material utilizes oxygen, which can lead to anoxic conditions and subsequent anaerobic decomposition, which in turn leads to formation of methane, hydrogen sulfide and ammonia (toxic gases). Biodegradability is the ability of organic substances and materials to be broken down into simpler substances through the action of enzymes from microorganisms. If this process is complete, the initial organic substances are entirely converted into simple inorganic molecules such as water, carbon dioxide and methane. Changes to the organic matter load can affect organic matter concentrations in the water. 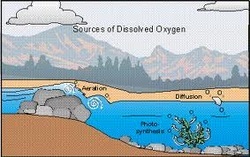 The breakdown of organic matter can result in low dissolved oxygen (e.g. hypoxia or anoxia) in the water (eutrophication). 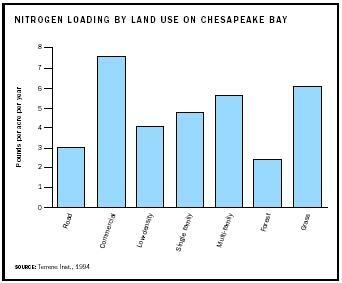 Sediment oxygen demand is higher when production is higher. Algal (both macroalgae and microalgae) blooms and increased plant growth occur in areas with increased nutrients and high light availability. Changes to the organic matter concentrations in the water of a wetland can result in: eutrophication a loss of sensitive species. The breakdown of organic matter can result in low dissolved oxygen (e.g. hypoxia or anoxia) in the water (eutrophication). Animals that are sensitive to low dissolved oxygen and cannot move to areas with better conditions may die, often in mass mortality events. 4.4.U5 Biochemical oxygen demand (BOD) is a measure of the amount of dissolved oxygen required to break down the organic material in a given volume of water through aerobic biological activity. BOD is used to indirectly measure the amount of organic matter within a sample. Measuring BOD is a very useful when examining the health of water, e.g. stream, rivers and lakes. BOD is essentially the amount of dissolved oxygen required to break down organic materials in a given volume of water through aerobic activity. Essentially it is a measure of oxygen uptake in water. Determined by the number of aerobic organisms and their rate of respiration. 4.4.U6 Some species can be indicative of polluted waters and can be used as indicator species. Biological indicators are aquatic plant and animal life that are susceptible to specific types and levels of pollutants. Many organisms require a specific range of physical and chemical parameters to flourish in a surface water.The level of pollution in water can be indicated by the species living there.​Typically, unpolluted water will contain a greater diversity of organisms than polluted water. 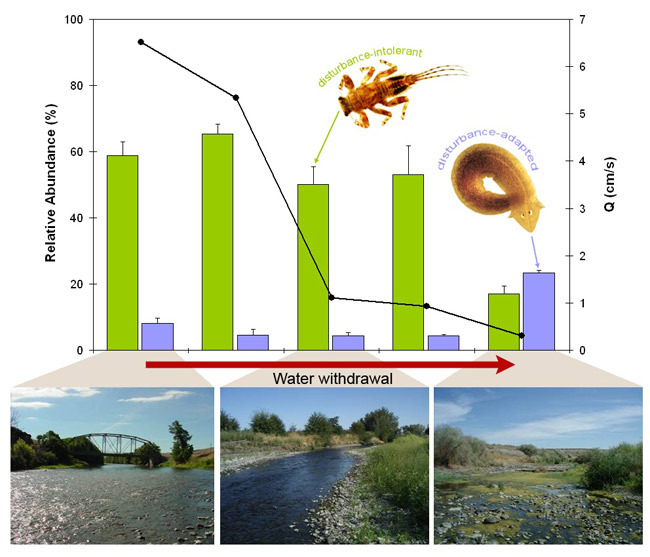 Polluted water will support larger numbers of tolerant organisms and have less diversity. ​4.4.U7 A biotic index indirectly measures pollution by assaying the impact on species within the community according to their tolerance, diversity and relative abundance. ​Biotic index is a scale 1-10 that gives a measure of the quality of an ecosystem by the presence and abundance of the species living in it. The Trent Biotic Index is based on the fact that certain species tend to disappear and the species diversity decreases as the organic pollution in a water course increases. The scale corresponds to the four basic water quality (Excellent, Good, Fair or Poor). Using this index and indicator species is another indirect method of measuring pollution. The pollutant are not measured directly but their effect on biodiversity is measured. Aquatic macroinvertebrates are often used as an indicator species. They have some general characteristics that make them very useful to assess stream health. carry out part or all of their life cycle within the stream or river. 4.4.U8 Eutrophication can occur when lakes, estuaries and coastal waters receive inputs of nutrients (nitrates and phosphates), which results in an excess growth of plants and phytoplankton. 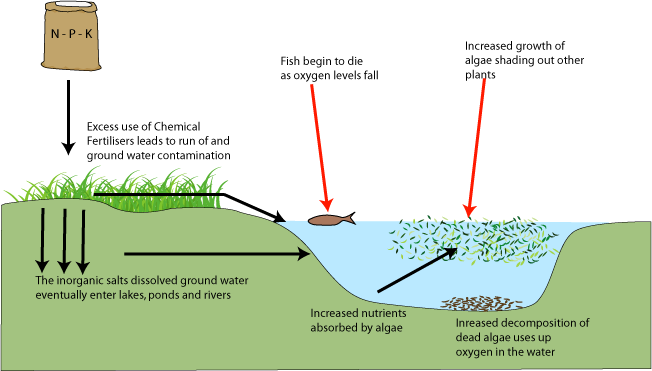 In eutrophication, increased amounts of nitrogen and/or phosphorus are carried into streams, lakes and groundwater causing nutrient enrichment. This lead to rapid growth of algae, accumulation of dead organic matter, high rate of decomposition and lack of oxygen. The role of positive feedback should be noted in these processes. The consequences of marine eutrophication is very simple to explain. The quiet unseen changes of the body of water caused by algae and plants suffocates many of the organisms as we said before. Not only does eutrophication kill other species but the organisms that happen to survive in the water with few oxygen change. Their bodies that were originally used of their surroundings evolve and adapt to the low oxygen level. They were once edible to eat, but as their body changes, so does the human reactions toward it. Many of the fishes that change, they become poisonous to our bodies causing either weakness, blurred vision, burning muscles, difficulty breathing, memory loss, organ damage, and even death. ​Human activities worldwide have caused the nitrogen and phosphorus content in may waters to double. 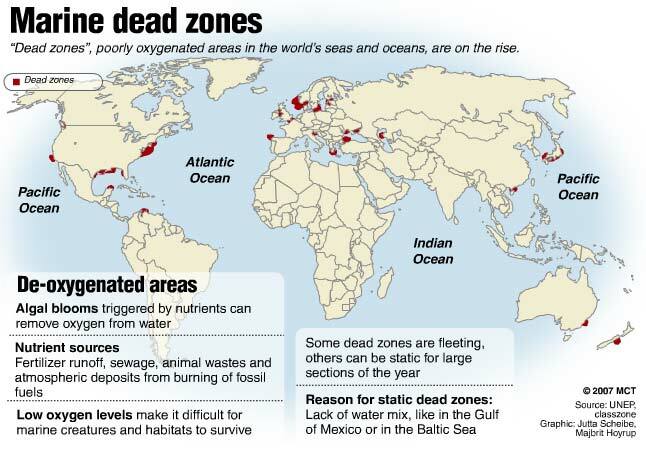 4.4.U9 Dead zones in both oceans and fresh water can occur when there is not enough oxygen to support marine life. ​removing pollutants from the environment and restoring ecosystems (for example, removal of mud from eutrophic lakes and reintroduction of plant and fish species). You need to apply the model in Figure 3 in the evaluation of the strategies. 4.4.A2 Explain the process and impacts of eutrophication. ​4.4.A3 Evaluate the uses of indicator species and biotic indices in measuring aquatic pollution. ​Biomonitoring involves the use of indicators, indicator species or indicator communities. 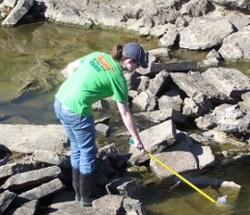 Macroinvertebrates, fish, and/or algae are often used. Certain aquatic plants have also been used as indicator species for pollutants including nutrient enrichment. There are advantages and disadvantages to each. Macroinvertebrates are most frequently used. Biochemical, genetic, morphological, and physiological changes in certain organisms have been noted as being related to particular environmental stressors and can be used as indicators. The presence or absence of the indicator or of an indicator species or indicator community reflects environmental conditions. Absence of a species is not as meaningful as it might seem as there may be reasons, other than pollution, that result in its absence (e.g., predation, competition, or geographic barriers which prevented it from ever being at the site). Absence of multiple species of different orders with similar tolerance levels that were present previously at the same site is more indicative of pollution than absence of a single species. It is clearly necessary to know which species should be found at the site or in the system. 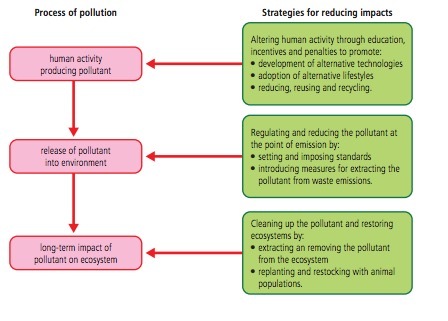 4.4.A4 Evaluate pollution management strategies with respect to water pollution. Avoid using nitrogen fertilizers between mid-September and mid-February when soils are wet and fertilizer is most likely to be washed through the soil. Do not apply nitrogen just before heavy rain is forecast (assuming that forecasts are accurate). Use less nitrogen if the previous year was dry because less will have been less lost. This is difficult to assess precisely. Do not plough up grass as this releases nitrogen. Use steep slopes for permanent pasture grass or woodland; use flat land above slopes for arable crops. This minimizes the greater risk of wash from steep land. Incorporate straw – straw decay uses nitrogen, with up to 13 per cent less nitrogen lost – it also locks up phosphorus. Direct drilling and minimal cultivation reduces nitrogen loss by up to a half. Less disturbance means less conversion of nitrogen to nitrate but straw has to be burnt. collect and bury pet faeces. removal of biomass (e.g. harvesting of common reed) and using it for thatching or fuel. ​​Correct use of terminology is a key skill in ESS. It is essential to use key terms correctly when communicating your understanding, particularly in assessments. Use the quizlet flashcards or other tools such as learn, scatter, space race, speller and test to help you master the vocabulary. Bio-indicators - Knowledge Group​Animation from the Center for Ocean Sciences Education Excellence. How bad is Eutrophication at Present? Planning and Management of Lakes and Reservoirs: An Integrated Approach to Eutrophication - A Student's Guide By the United Nations Environment Programme (UNEP) International Environmental Technology Centre (IETC). © UNEP 2001. Countries with limited access to clean water often have higher incidences of waterborne illnesses. A wide range of parameters are used to test the quality of water and judgments are made about causes and effects of water quality—how can we effectively identify cause–effect relationships, given that we can only ever observe correlation? Paul Andersen explains how water quality can be degraded by pollutants. Wastewater is the main source of water pollution and can be measure using the BOD (biochemical oxygen demand). Dead zones, cultural eutrophication, disease, and other pollutants are included. A basic description of sewage treatment, septic systems, and water purification is also included. Even though 80% of trash starts on land, tons of it ends up in the ocean, swirling around in a massive patch of plastic debris. TED talk on the Great Pacific Garbage Patch -- an endless floating waste of plastic trash. Eutrophication is an excess of nutrients in a body of water. It causes an overgrowth of algae, which causes a chain reaction of events that destroys the lake ecosystem. Folke Rydén is one of Sweden's leading documentary and non-fiction program producers. He was for a long time correspondent for SVT stationed in Washington and Hong Kong. His latest project is on DIRTY WATERS, algae blooms, dead sea beds -- the Baltic Sea is suffering.